CONGRATULATIONS are in order for Rhythm City actress Amo Chidi, who recently gave birth to a baby girl. 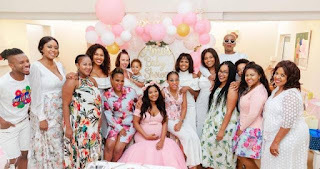 The Rhythm City actress revealed in February 2019 that she is expecting a baby, then followed two baby showers. She has know shared the first snaps of her baby girl. Her bundle of joy was in a pink attire lying on a pink polka dot blanket. “For I know the plans I have for you, declares the Lord, plans to prosper you and not to harm you, plans to give you hope and a future, “she captioned one of the pictures, while gushing about how perfect her new-born is. She captured the second snap “You are perfect”.